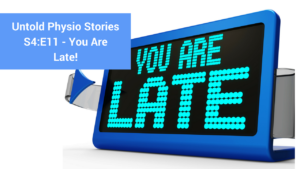 Untold Physio Stories (S4E11): You Are Late! Have you ever had a patient be continually 15 min late to their appointment? What if they’re you’re last patient of the day? Listen in to how Dr. Erson Religioso handles this. 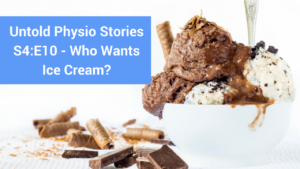 Untold Physio Stories (S4E10): Who Wants Ice Cream? This is a story you have to listen to, to believe. A patient experiencing TMJ issues only improves when she eats…ice cream! Check out Dr. E’s The Ecelctic Approach to Temporomandibular Management here! 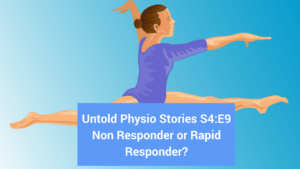 Untold Physio Stories (S4E9): Non-Responder or Rapid Responder? A young gymnast is not responding to treatment for her knee pain. When the “bio” is ruled out, what else could it be? Guest host, Dr. Andrew Rothchild – @ARothschildPT on Twitter and Instagram and co-host of the Healthcare Disruption podcast joins us this week. What happens when your patient starts demonstrating signs of a heart attack (cardiac event) while performing your assessment? Listen in as physiotherapist Dr. Andrew Rothchild, at @ARothschildPT on Twitter and Instagram and co-host of the Healthcare Disruption podcast shares his story.